For a few days a chicken here and a chicken there were disappearing. Sometimes they go rogue and try and live in the woods but they eventually come back to roost in the coop. We would count the chickens at night and slowly but surely their numbers were dropping. There are many possibilities as to what could eat the chickens up here in the northland. We lost a chicken to an osprey a few years ago and some other predators include: coyote, wolf, owl, eagle, weasel, pine martin, fox etc. Since we didn’t know what was eating the chickens and the precautions against an eagle and a weasel are quite different- Jared set up the trail cam to see what was eating our poor ladies. Unfortunately we had to go out of town for the weekend, so we had to hope our ladies could survive long enough for us to get back home. When we returned we had a couple fewer chickens but some more answers. Three answers to be exact. A mother raccoon and her two babies. Here are some pictures of the sad turn of events. This hen was ironically named Racoony because of her black and white plumage, and here is a picture of her happily walking around outside the coop. Next up is a picture of Racoony in the mouth of a Raccoon. Four chickens now rule our land instead of 14. RIP ladies, we are sorry you aren’t here anymore and even more sad our egg production is down to one or two eggs a day. I don’t think I will ever be able to go to a normal ski resort after this adventure. Winter Park Resort (the runs in the background) costs $144 a day per person. Our day cost a half a tank of gas for the snowmobile and I suppose we had to have an adventurous spirit. We did not see one other snowboarder or skier the whole day, unlike the crowded lines and packed out lunch rooms of the resorts. Yes the perks where pretty endless. The wonderful Dan and Maria (Jared’s sister) took us out for this special trip. Dan keeps his snowmobile up in the mountains for an easy getaway. After the two hour drive into the mountains Dan and Jared picked up the snowmobile while Maria and I got some last minutes snacks- cheese, a giant pre-made sandwich and some spring rolls. All the essentials. Well, this great day started with these thoughts. We finally reached the top and reversed the truck into a large snowbank and then Dan backed the snowmobile out of the truck and onto the snowbank- flawless. This is us strapping on all our snowgear and preparing to head up the mountain- all the while giant flakes continued to surround us. I would have to say that the most physically demanding and most scary part was hanging onto the snowmobile as we flew up the mountain. Dan was mostly the driver so he would hang on to the side handle bars while the passenger would cling to that bar in between. Both people would straddle the snowmobile with some big knee bend. The right hand would be clutching your snowboard. ALL THIS WHILE SMOKING IT UP A GIANT MOUNTAINSIDE! Yes, i thought it was slightly terrifying as well. Since there was lots of powder and the steepness of the route- Dan would yell for us to lean out or lean in so that we would not tip over. And when we got to the top we would have to jump off (don’t worry he slowed down) and he would continue down the slope to pick up the next person. I think my left hang was bruised by the end of the day from how hard I was gripping that bar! So worth it though. I am so glad we had our own personal guide to take us on this great adventure. We will never forget this day. We have returned from our yearly spring trip. Two springs ago we went to Colorado, last year we went to California to see my oder sister and this spring we were back in Colorado again. Jared’s folks and sisters live in Colorado so it is a great time to see them and see those beautiful Rockies. We went on several hikes and stayed close to Estes Park. It is quite rewarding to hike around mountains since there is a gorgeous view around most corners and during those scenic lulls you know at the top of your hike will result is a whopper of a view. Hudson who is a wildlife enthusiast was in animal heaven during our time out west. Since we had a few long drives, Jared came up with the idea to give $1 to whoever first spotted large wild animals first. This game persuaded the girls to become wildlife enthusiasts as well. We spotted Elk and even a herd of mature male big horn sheep. Of course I left my camera at home when we spotted the rams. Seeing them bound across the river rocks and then fly up the steep mountain with ease was a highlight of that day. The next post will be about our backcountry snowboarding adventure, so stay tuned. This winter was fairly mild with only about a week or two of below zero weather, and not all crammed together to make a consecutive two weeks. Last winter we had about a month straight of -30 and -40 weather. The kind of weather when you step outside and think why on earth did I choose to live here. Up North here we must gasp for breath because lungs don’t appreciate that sort of harsh environment. But not this winter, we might be getting “soft” up here because we had such a balmy winter. Well, maybe not. 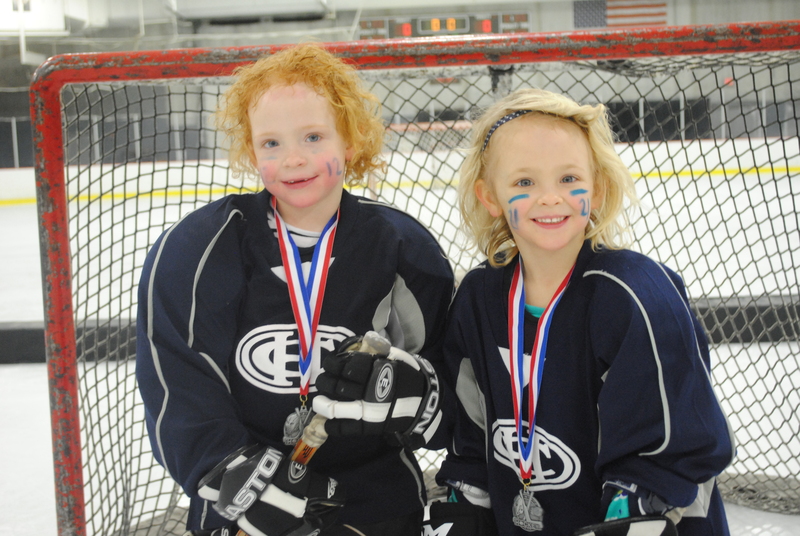 We had a glorious wonderful winter full of nice weather and jam-packed full of hockey. Oh sweet hockey. I really do love playing hockey. And one of the best new developments is that Jared is really coming along. I would not go so far as to say the student has become the master but yes he has some nice hockey skills. He even fooled me with some toe drags at the end of our “season,” to my dismay and his delight. We live in Cook, MN. It is far from malls and traffic and shows and events. We have to make our own fun up here and I wouldn’t have it any other way. Instead of heading to the next big thing, we invite friends over for game night or sit around kitchens eating whatever the fridge can produce. Or better yet, we head to the rink. Jared and my idea of a date night is paying a babysitter, who usually ends up sitting in our house for a few hours while the kids sleep, and we head to the outside ice within walking distance, or we head to Babbit. Yes Babbit. Babbit is a teeny tiny town that holds a wonderful inside ice rink. The rink manager was telling us last week that on high school game nights, you couldn’t even squeeze your way inside this place. 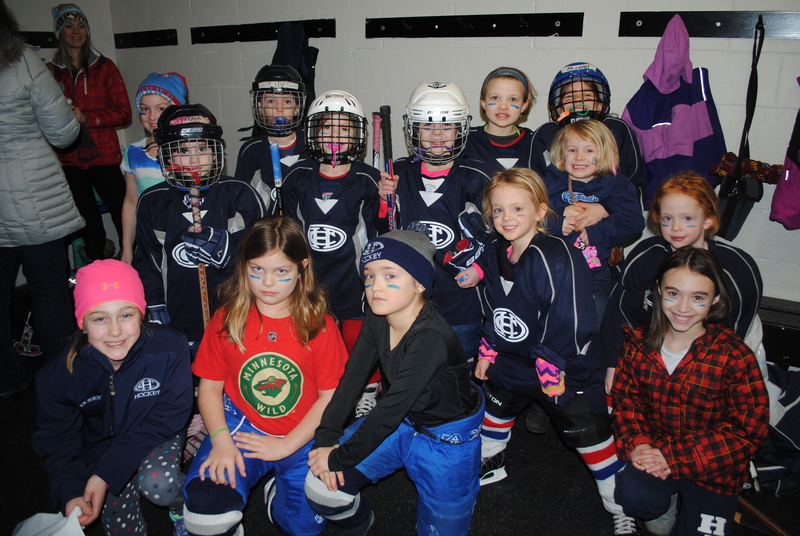 “And we even had gosh darn cheerleaders!” This rink at Babbit used to be a central meeting location for high schoolers and families but has now been reduced to hosting our Thursday and Sunday night men’s league. We get our kiddies ready for bed, give last minute babysitter instructions and then drive the hour to Babbit. Thankfully the owner of White Eagle Resort drives Jared, me and another Cookite in his nice truck with heated seats and things that talk to you. I usually get dressed alone and the rest of the dudes get dressed, then we head out to skate, sweat, shoot, mess around and get an amazing workout all while playing this game we all love. It is wonderful. 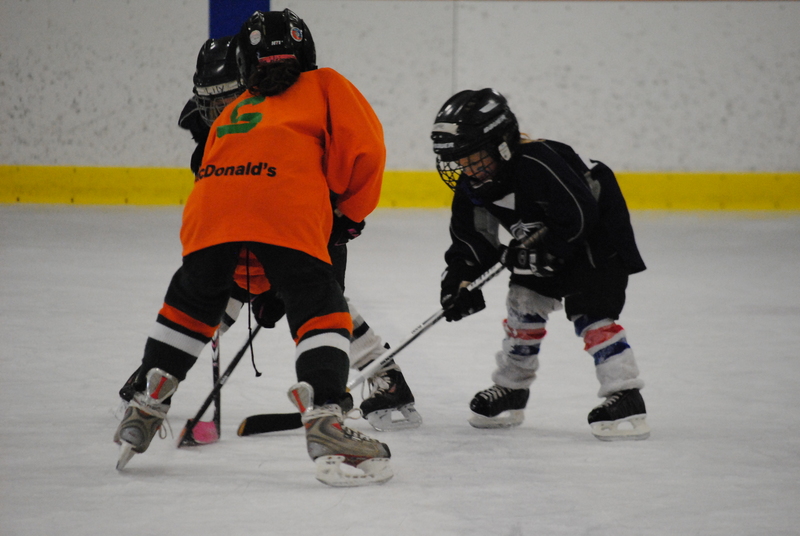 Sometime around late December the outside ice in Cook was flooded and the pickup games ensued. 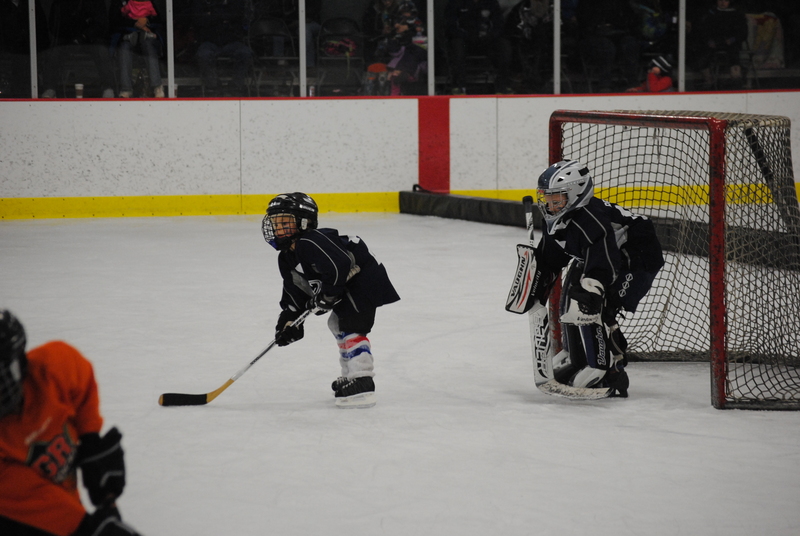 We usually had enough players for a 4 on 4 game. The city of Cook just recently opened a recreation center called the Doug Johnson. It will be a great asset to the community and can be rented for events, birthday parties, whatever. I am glad we have such a great meeting place in Cook. The best part of the Doug Johnson ice was it took roughly 57 seconds to drive there. Jared would drive the fourwheeler over to plow off the snow so we could quickly get down to business. 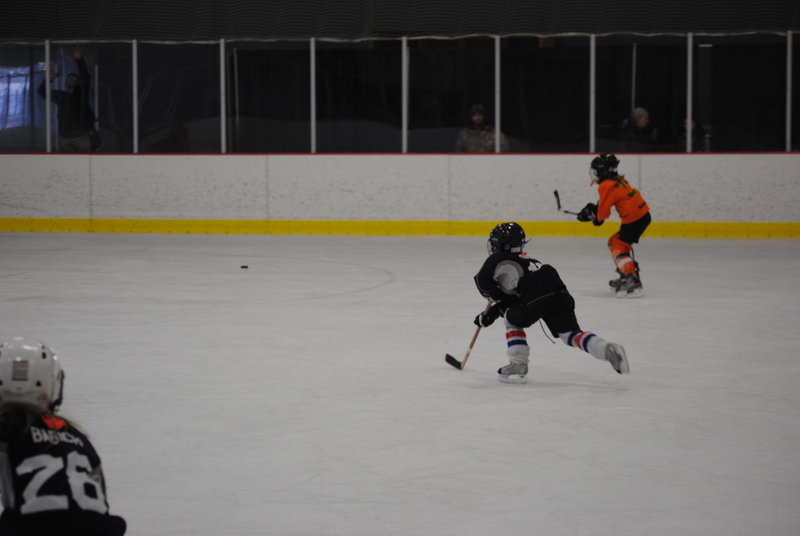 The first weekend of March, Jared organized a hockey tournament- only four teams entered the tournament but slowly and surely we are bringing hockey back to this little town. Sorry about the yearlong hiatus. I took a yearlong break from blogging and am ready to jump back into sharing our adventures and life with y’all. Why did I leave and why did I come back? I left because I had to pass a licensing exam for my current part time job and that took up most of my free time. I had to study when the kids were in bed etc. I was also getting tired of blogging. My am I back? I have missed blogging. A few days ago I looked back over the many posts I have done in the past years and love seeing how our life has changed and how cute the tiny kids used to look. My blog is a wonderful way to sort of scrapbook my way through their childhood. I also like saving me recipes on this blog. I check back here every St Patty’s Day for recipes as well as for my recipes for wild rice soup and monster cookies. Not a whole lot of reasons- but enough for me to stop and enough for me to come back. We had a great, exciting winter full of winter walks, hockey, four wheeling, cross country skiing, trail cam discoveries, fishing and friends. 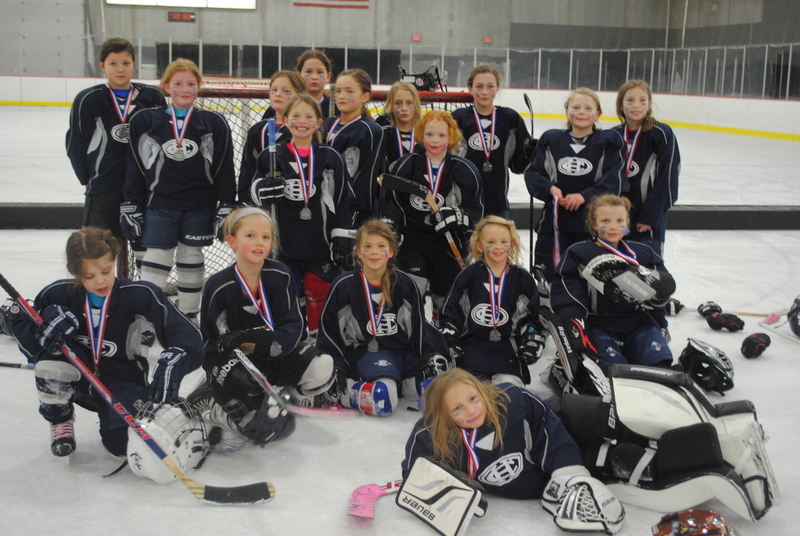 I thought I needed to put down some thoughts on the ladies first hockey season, before it feels like it never happened. First of all, I cannot believe the difference of the girls skills between the end of October when our season began to the last weekend of February. When we stepped onto the ice for the first practice, one of the coaches asked, “So, is this the first time they have tried skating?” Yeah, that is where we started. 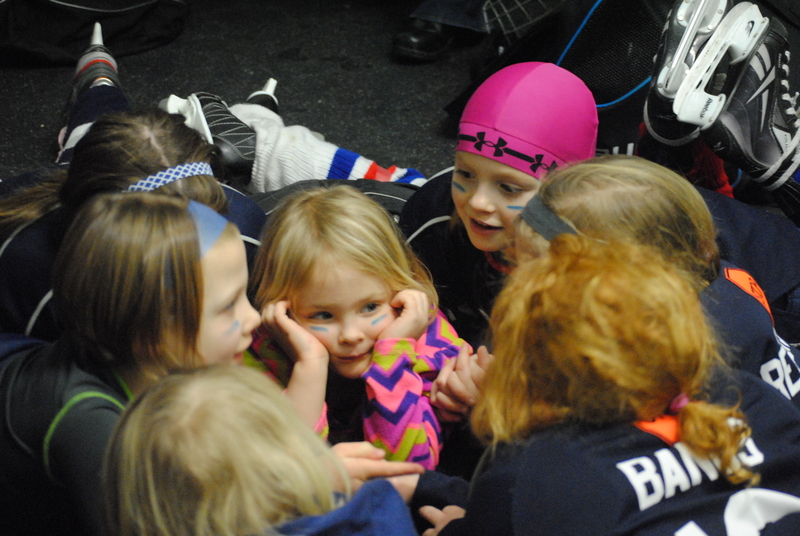 Sophia improved from spending approximately half of practice wallowing on the ice, rolling around claiming that this was her very last practice ever and there were some very large crocodile tears that accompanied those words. 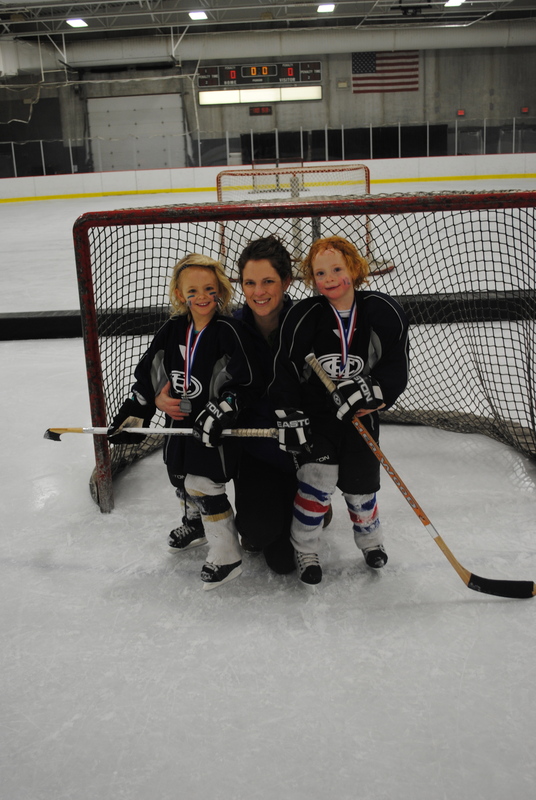 I had to wear skates for the first few games because if Sophia got too far away from the bench during her two minute shift, she would never get back to the bench in time for another girl to take her place. So when the two minute buzzer would sound I would hop over the boards, pick her up, and then skate her back to the bench. I had to do that for the first few games and then got to wear boots for the rest of the season! 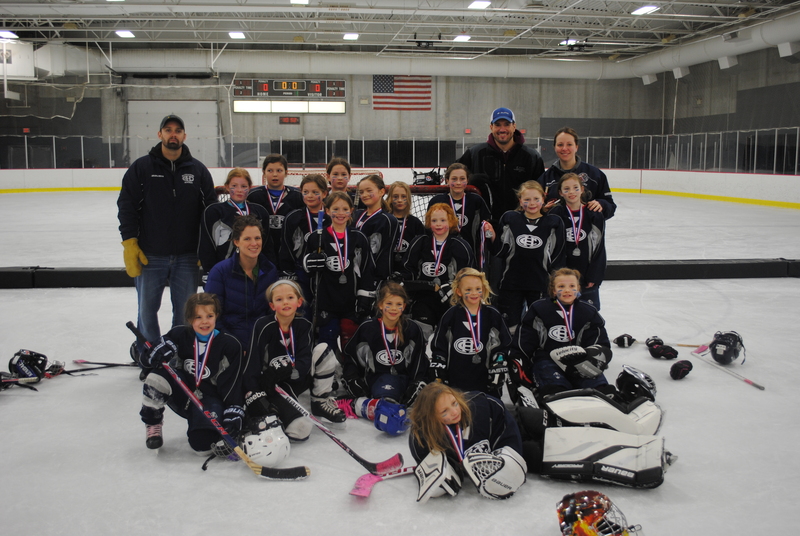 The beginning of the season was a tremendous challenge for Aleah because she was not good at hockey. Aleah likes to be a high achiever and isn’t used to being at the bottom rung. During practice she was constantly glancing all around her at the other girls who were so much better than her. Many, many times she wanted to quit- to just walk away from the hard stuff. To turn her back and never return to this hard sport where everyone (besides Soph) was so much better than her. She wanted to return to the spaces she felt confident- the places where she was already excelling. 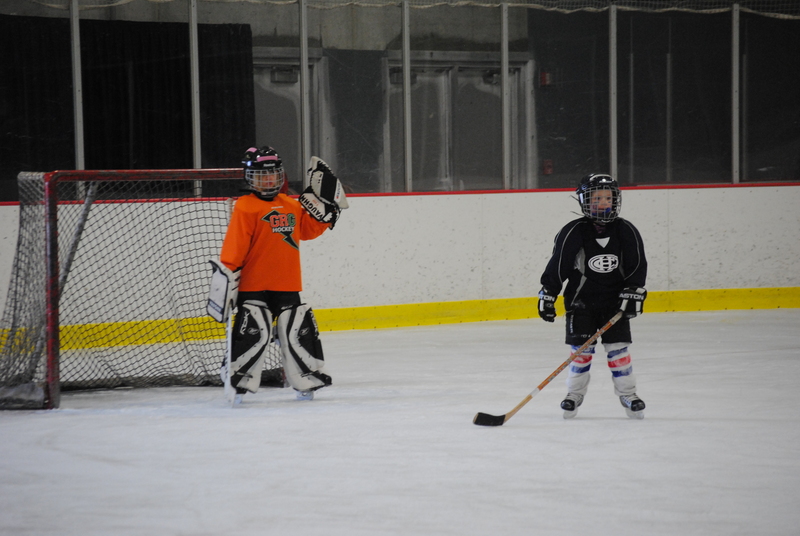 But I continued to drive them the 45 minutes to hockey practice and as time wore on she became more and more confident at her skating, passing and shooting skills. 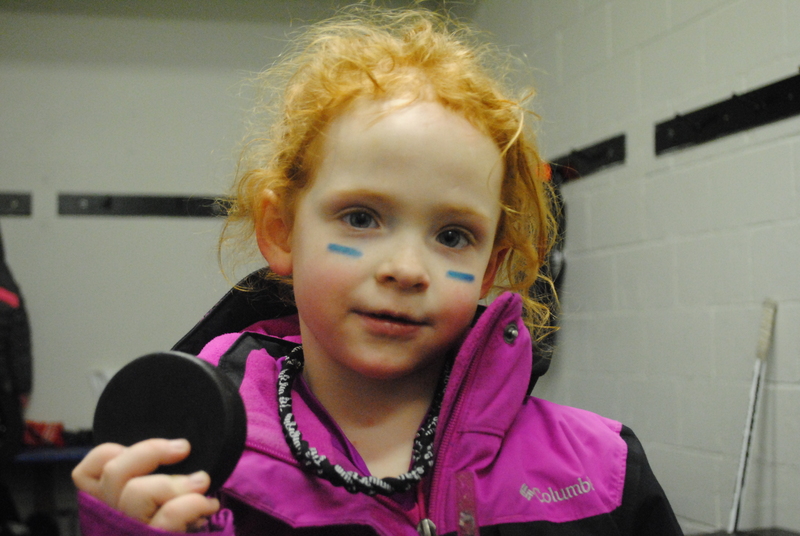 She had been trying for most of the season and I could see in her eyes how badly she wanted to shoot that puck past the goalie. 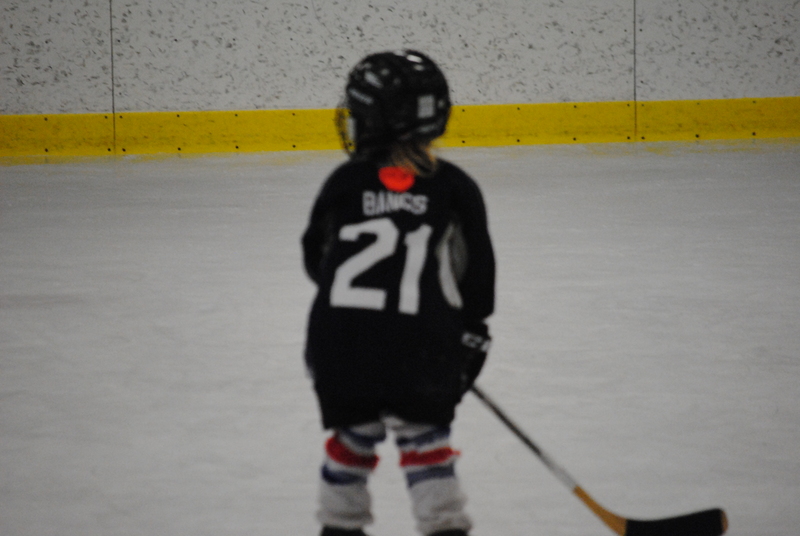 While we were at a tournament in Brainerd, she scored her first goal ever. Immediately after she scored, she raised both arms up into the air and held them there for about 10 seconds. She was smiling so giant that I thought her mouth was going to reach around her head. I saw the hard work that went into that goal. I saw the tears and frustration behind those tough practices. As the head coach cheered for Aleah, he glanced over at me with tears welling up in my eyes and asked, “You going to be okay over there?” And I beamingly assured him that I was quite alright. Never better actually. Of course we got the big game puck and will have to do something cool with it. All in all, hockey was a wonderful experience. Yes we spent some time in the car and yes we missed a few naps, but we also learned how to work through hard stuff and to be rewarded for it. After a practice towards the middle of the season Aleah said to me, “Hey mom. Now I know why you like hockey so much. It is because it is SO FUN!” You got it girl. Hockey is so fun and I am glad we can go down this road together.